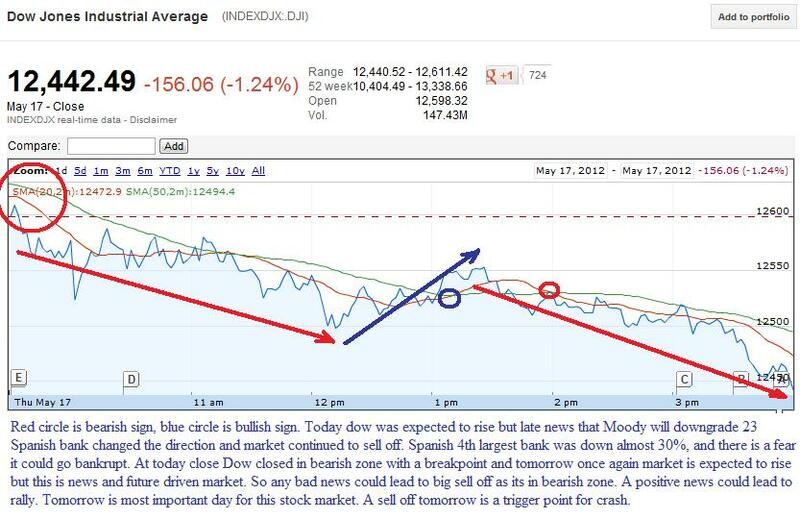 Consequences of High Frequency Trading: Since May 1st Dow lost 896 point and S&P500 lost 111 points. This days stock market is moving up and down too fast. It took 5 month (Oct 2011 -Feb 2012) for Dow to rise 2500 point and S&P 171 point. Since May 1st, Dow has lost 896 point and S&P500 lost 111 point. This kind of move is not normal and it could lead to another flash crash in future depending on the bad news or Greece exit Euro or if JPM loses keep piling up. From 2 Billion loss, JPM is now expected to report 3 billion in loss and that 1 billion loss happens in a matter of 4 days. The market was expected to rise today, and dow futures were 50 point up and S&P500 futures were up 6 point but once again a late news that Moody will downgrade 23 Spanish bank after hours, changed the direction of the market and we saw big sell off. One thing to notice today is VIX was up 10% and S&P500 VIX futures were also up very sharply. June future contract closed at 26.20 while July future closed at 26.70 So another run up of 10% in VIX will bring it into backwardation and we can expect VIX to rise very sharply. So tomorrow is very important day, if Dow falls 100 point and S&P500 falls 10 point, this market is in trouble big time. So, Becareful with your investment. S&P500 could drop another 10% -15% if 1275 level is breached. Above is 5 year chart of S&P500 and its getting closer to 2008 financial crash. Central banker need to intervene soon or else it will be too late. For upside Dow needs to break 12472, while for downside Dow needs to break 12422. There is no support level between 12232 and 12422. For upside S&P500 needs to break 1310 while for downside S&P500 needs to break 1396. There is big support level at 1390. There is no economic data from US. 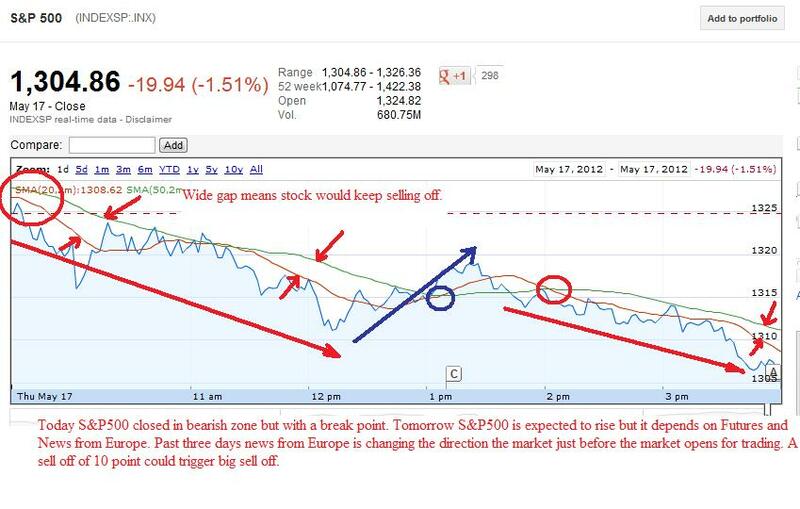 So everything depends on the rumor or news out of Europe and it would set the direction of stock market. "Watch out for US dollar index, if its above 81 its not safe to invest money in stocks. Be on the sideline. http://data.cnbc.com/quotes/.dxy " Just becareful tomorrow, keep a close watch on VIX.